The third item on the agenda that day was the thorny issue of how to deal with Eoin MacNeill and the recent Rising. Born in Glenarm, Co. Antrim on 15 May 1867, MacNeill’s family considered education to be of great importance and he went on to gain a degree in Constitutional History, Jurisprudence and Political Economy. In 1887 he became a Junior Clerk at the Accountant-General’s Office in the Dublin Law-Courts – the first to be appointed through examination rather than patronage. In the same year, at the age of 20, he began studying Irish which led him to study Old and Middle Irish and Early Irish History. Throughout the 1890s MacNeill continued with his studies and writings, becoming editor of the Gaelic Journal (1894-7), co-editor of Fáinne an Lae (1898-9) and the first editor of An Claideamh Soluis (1899-1901). He was influential in the founding of the Gaelic League in 1893 and became its Vice President in 1903. His academic standing continued to rise. After being elected a Member of the RIA in 1907, he went on to become the first holder of the Chair of Early Irish History at the University College Dublin. MacNeill’s 1913 Gaelic League article ‘The North Began’ called for the formation of a nationalist volunteer force and he was later instrumental, along with the Irish Republican Brotherhood, in the formation of the Irish Volunteers. Critical for MacNeill was the belief that the Irish Volunteers should be a defensive force, reacting only to British aggression or conscription, but the IRB held no such belief and issued the order to rebel against the British. The order was given for Easter weekend 1916; it is clear that MacNeill issued a countermand but this did not stop the Rising, it only postponed it for a day. Although he had not taken part in the Rising and indeed had tried to stop it, MacNeill was arrested, court-martialled and sentenced to life imprisonment. From Kilmainham he was taken to Dartmoor and later, to Lewes in Sussex. He was released in June 1917. Caricature of Eoin MacNeill, from A book of caricatures / by V. L. O'Connor. Dundalk, 1916. 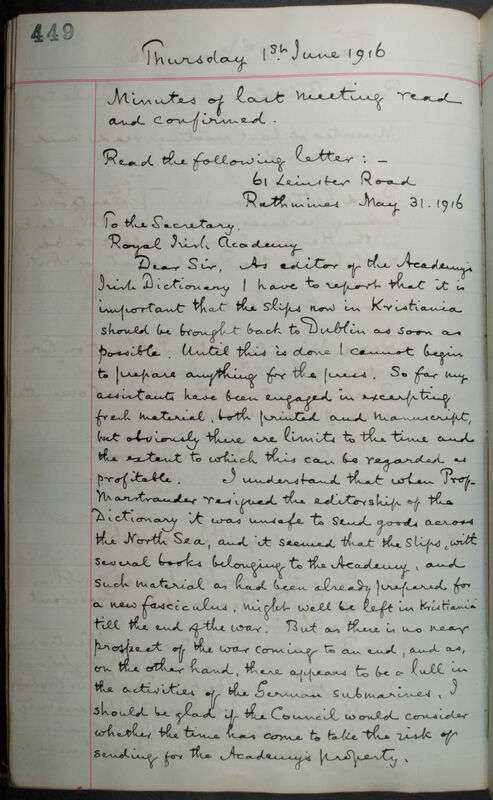 And so, at that June meeting of the Council in 1916, having first discussed Bergin and his stranded books and research notes, the Council turned its attention closer to home. 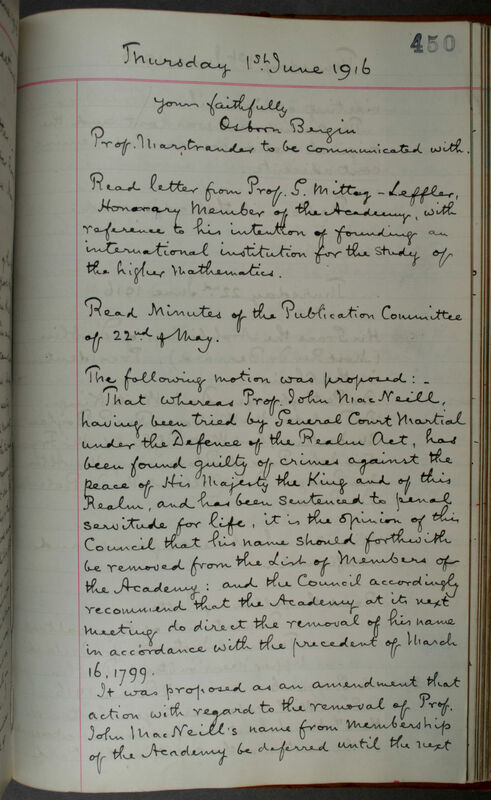 The Council of the Academy moved to remove Eoin MacNeill’s name from the list of Members, effectively expelling him from the Academy. Ireland post Rising was a different world; events moved quickly and public opinions shifted. By the end of 1918 MacNeill was elected a Member of Parliament for the National University and by the end of 1919 a number of people, particularly Rev. Timothy Corcoran, MRIA (Professor of Education in UCD) and Count Plunkett, MRIA, worked to re-instate him as a Member of the Academy. 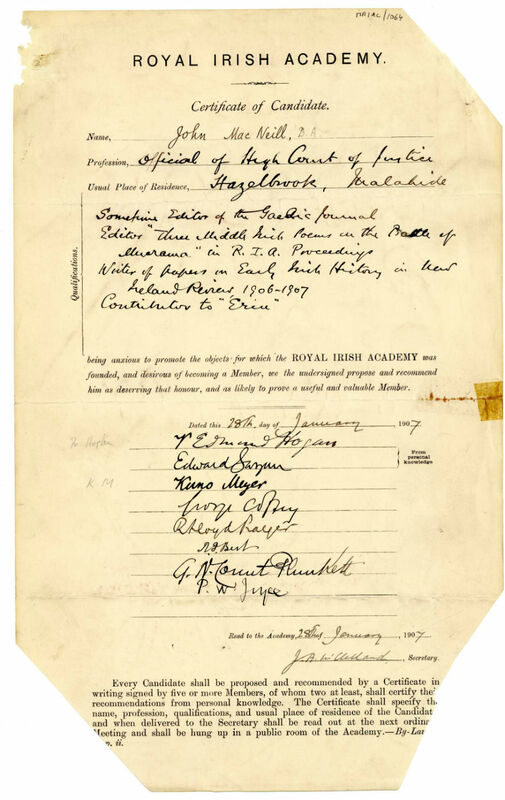 At a Meeting on the 27 June 1921 Count Plunkett moved and E. H. Alton seconded a motion 'That any and every Resolution or other Act of or within the Academy passed during or after the month of June 1916 and terminating the membership therein of John MacNeill, be and hereby is rescinded.' The motion was carried and almost exactly five years after his expulsion, MacNeill was reinstated. 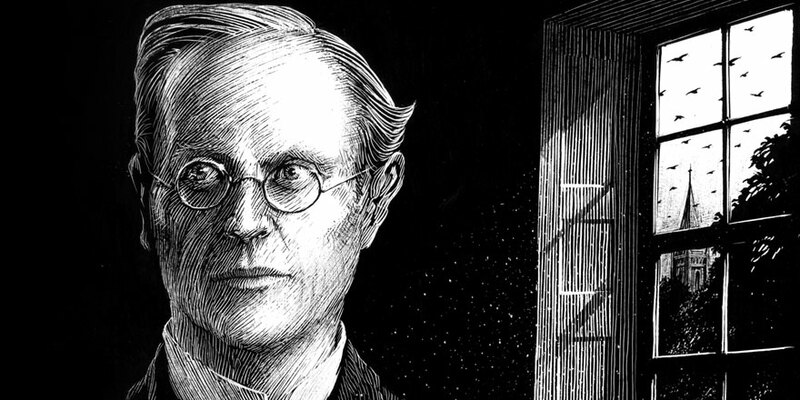 Eoin MacNeill went on to have a long and distinguished academic and political career. He was re-instated as professor of Early Irish History at UCD, and went on to become the 29th President of the Royal Irish Academy in 1940. 1916 Portraits and Lives is available to purchase from our online shop. [i] The 1st volume (D-Deg) edited by Marstrander was published in 1913. The next vol (E), edited by Bergin was eventually published in 1932 and the project was completed in the mid 1970s - the war was well and truly over by then! The Dictionary of the Irish Language (eDIL) is freely available online. Fifth and final blog post in our series on the five Honorary Members featured in our exhibition 'Prodigies of learning: Academy women in the nineteenth century'. This month's Blog post looks at the Book of Ballycummin, the subject of our 4th Irish Manuscripts Conference taking place 7-8 March.